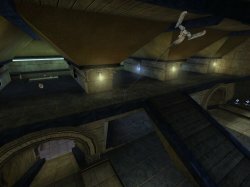 The Chaos Grappling Hook is a very basic tool on the surface, but one which has an extremely large effect on UT2004 gameplay. 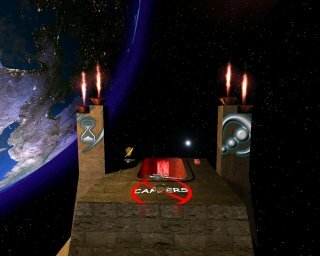 Especially when used in combination with the Anti-Gravity Belt, the grappling hook enables players to move in many fun new ways and to reach all kinds of new areas in maps. The result is an endless variety of truly 3d Chaotic action. The grapple has a very basic design which allows even first time users to start hooking around. – It’s an ‘off-hand’ grapple, so you don’t have to switch away from your weapon in order to use it. – One press of the ‘Grapple Hook On/Off’ key fires the grapple. As soon as it hooks something it will instantly start to pull you towards that point and then hold you there. Once you get there, simply hit the same key again to be released. In addition, while you are hanging from your grappling hook, the weight of your body will cause the cable to slowly be released, and you will be lowered. For this there is an optional 2nd keybind, the ‘Grapple Hook Up’ key, which will wind the cable back in so that you will be pulled back up. The grappling hook must be disengaged before you can enter vehicles. 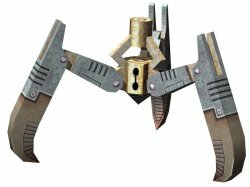 Note: You have to bind at least one key for the grappling hook in the Chaos section of your controls menu, the master key for shooting, stopping, and releasing the hook. And there is one optional ‘hook-up’ key for going up the cable while hanging or swinging. The Chaos Anti-Gravity Belt (aka GravBelt, or Belt) is a powerful tool, and those who use it well can literally rain fire from above on hapless victims below. Because when you activate one of these beauties, gravity’s effect on you will be greatly reduced for a period of time. This allows you to jump higher and float freely thru the air for a few seconds before you come back down. But be creative! Combined with double jumps and dodge jumps and so forth, many very cool things can be done with this Belt. Try it together with the Chaos Jump Boots & Grappling Hook! The GravBelt will be ‘Off’ when you pick it up, so that you can use the ‘GravBelt On/Off’ key to turn it on and off, and use it only when you wish. GravBelts use energy, and must be recharged for continued use. GravBelts can be recharged up to 2x the initial charge, which is adjustable in the Chaos configs. Through the Chaos configs, GravBelts can made to spawn randomly throughout the maps, or they can be given to players automatically each time they spawn. If the Belts are spawning randomly, the only way to recharge them is to pick up another Belt. If players are spawning with a Belt, then the Belts will slowly recharge whenever they are turned off. Anytime you have an Anti-Gravity Belt, an icon will appear on your HUD, letting you know how much time you have left to float. As an added bonus, players who are using a GravBelt will be less affected by the Gravity Vortex. Anti-Gravity Belts do not function underwater. The Belts will automatically deactivate upon entering water. 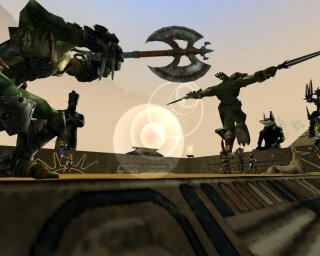 Note: The actual GravBelt models would not fit correctly on all the different player models available in UT2004. So while you will see the model for the Belt as a pickup item in the map, we have elected not to place them on the players themselves. So instead we have added a visual effect in the form of a blue trail to let you know who is using a GravBelt (these belt-trails will be team colored red/blue in team games). Note: You have to set one key in the ChaosUT2 key bindings for turning on and off the belt! On the Chaos configs page, is an option to replace the standard Adrenaline system with the Chaos Relics. If you do so, then all adrenaline pills and combo-moves are removed from the game, and the Chaos Relics will spawn randomly around the map. There is also a new keybind in the Chaos section of your keybind settings, for ‘Drop Relic’. This allows you to toss the Relic you are carrying, and pick up another. However, once you have tossed a Relic, you will not be able to pick it up again until you are fragged, or until another player uses it. Strength – This relic will increase the amount of damage you inflict on your opponents by a full third. Players holding this relic will have a highly visible red-ish glow coming from their arms. Vengeance – This relic comes with two options on how it deals out it’s carnage (selectable in the Chaos Settings). The first option is a small but powerful explosion, killing most nearby players instantly. The second option spawns a group of spirits that will pursue any nearby players, killing them on contact. Players carrying this relic will leave behind a trail of floating skulls. Speed – The relic of speed causes your legs to become more powerful, and you can run faster as well as jump higher, swim faster, have more air control. Players carrying this relic have white trails beind them, almost like small jet streams. Note however that CTF flags and some other objects will produce drag, and will greatly reduce the effect. Regeneration – This relic encompasses the player in a green glow that slowly heals them up to their normal health levels. It is not a quick process however, so health pickups are still necessary when in the thick of battle. Shield – This relic causes a swirling shield to envelop you, and reduces all incoming damage by a third. Players using this relic will have a visible yellow shield around them – but only when they are taking damage! 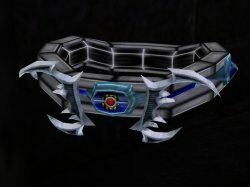 Vampire – When using this relic, anytime you damage another player, you will recieve a portion of their lost health added to yours. This transfer is done via visible blood trails that will travel from the victim to the vamp. Players using this relic will have a light purple-ish glow about them – but only while they are receiving the life-giving blood trails. No longer do players have to sit it out after getting fragged while playing Invasion – now you can play as a Chaos Proxy Mine! When you are fragged, you will be put into spectator mode just like normal. Then, whenever the still-living players fire proxy mines, a message will flash on your screen letting you know when there are proxies available in the map to control. When you see the message, press the “kick” key to be put in control of the proxy. 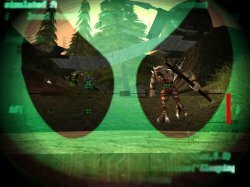 You will know when you are in control of the proxy when you see the HUD pictured here. You have limited controls available when you are a proxy. You can jump with your jump key, you can turn (but not strafe), and you can explode by hitting your fire key. So the idea is to continue helping to hunt down and kill monsters (or of course just goofing off and bouncing around the map messing with your friends who are still trying to kill monsters). Your HUD will display monsters as green icons, so hop around and chase them down, then blow yourself up when you get close enough! The ‘proxy’ of course is the little, yellow, ‘living’ Proximity Mines fired by the Chaos Claw2. And you can repeat this process as long as there is another proxy available in the map, so encourage still-living players to grab a Claw2 and use them! Keep in mind that proxies often don’t live long, and also that every “dead” player will be getting the same message about available proxies. So if the proxy dies, or if there isn’t enough for each dead player, you may not get to control a proxy every time you see the message. Somebody else may have beat you to it, or the proxy might die as soon as the message is flashed. Note: You have to bind the “kick” key in the ChaosUT2 key bindings in order to use this feature! We have provided armor shards to pick up in all maps. Some adrenaline pills and health vials will be replaced with armor shards, randomly throughout the map. Not all health vials or adrenaline pills will be removed! So for example, if a map has a row of 5 health vials, maybe only 1 or 2 will now be armor shards. As with all Chaos items however, it may work differently in a map made specifically for Chaos. Mapmakers can place them in ChaosUT2 maps anywhere and not have them rotating with pills or vials if they choose. The shards give five points of armor each. Note: When using the Chaos Relics system instead of Adrenaline, then all adrenaline pills are replaced with armor shards, and the health viles are not touched. The model for the Jump Boots was included with the game, Epic just did not use them. So we have made them available in games of Chaos. You get 5 jumps each time you find the boots. And when you have them there will be an icon on your HUD which shows how many jumps you have left. Note: The Jump Boot models do not fit correctly on all the different player models available in UT2004. So while you will see the model for the boots as a pickup item in the map, we have elected not to place them on the feet of the players. There are just too many player models whose feet don’t fit the boots. So instead we have used a visual effect to let you know who is using the Jump Boots. This is a custom teleporter field that can be placed anywhere in the map by hitting the custom keybind we have created for it. Once placed, if you hit the key a second time, you’ll be instantly teleported back to that location! Very nice if you want to get out of trouble quick! The teleporter uses the same energy that powers your GravBelt (the gravbelt icon on your HUD with an energy counter on it). It requires 60 energy points to place the teleporter field, and it is then ready for use. Also, it is only good for one use per field. Once you actually teleport through it, it will disappear, and you have to start over again by placing a new field. The teleporter field will also disappear if you are killed before using it. BTW: CTF players beware! You can only teleport yourself, NOT the flag! It will just be dropped at the place you teleport from. Sure, you may have seen it before, but now we’ve brought it into ChaosUT2. Pick your own logo (if you submitted one of course) or use one of the stock choices, and paint it on the walls and stuff while playing. Simply bind a key for Spray Painting in the Chaos key bindings, and then select your choice of logo in the Chaos configs. Then all you have to do is walk up to a wall or something while playing, and hit your Spray Paint button. To prevent spamming of this feature, logos last for a limited amount of time, and you must wait several seconds after painting one before you can paint another. You can change which logo you are using while playing (without leaving the game) by hitting your Esc key and going into the ChaosUT2 settings. How to use custom spraypaints in Chaos UT2004. Note: To see the logos in-game, you must have ‘Projectors’ turned on in your Display settings! Now you can get credit for all those things you did in the match! Both good, and bad! All you have to do is hit the F1 button at the end of a Chaos DM match, and you can toggle between the scoreboard, and the Awards. Melee Master – Make the most kills with a melee weapon. Nuke Hog – Make the most kills with superweapons. Spree Killer – End the most killing sprees. Sharpshooter – Get the most headshots. Grave Digger – Make the most tombstone-producing kills. Pain lord – Inflict the most damage. Purple Heart – Take the most damage. Proxy fodder – Get killed the most by proxies. Darwin Award – Commit the most suicides. For those who want a more visible indication of when other players are typing, we’ve included a talk icon. There is a client side option in the Chaos configs, and if you turn it on, you will see an icon appear over the heads of other players when they are typing. What you do with this information is up to you. Note: To see the talk icons, you must have them turned on in the Client Settings of your Chaos configs! Here’s one that helps to increase the tension: If you come close to the “point of no return” of zero health, you will be able to hear your heartbeat louder and faster… and so can any nearby enemies…. a nice reminder that you should keep your eyes open for some extra health! Giving ChaosUT2 frags one final thrill! When you finish off another player, a chalk outline will show up, marking the spot of your success. The chalk outlines will last for approximately 30 seconds. And when you get ‘special frags’ (ie; killing spree or multi-kills), tombstones will appear rising out of the ground. These will even show the victims name, so you know who you just killed. 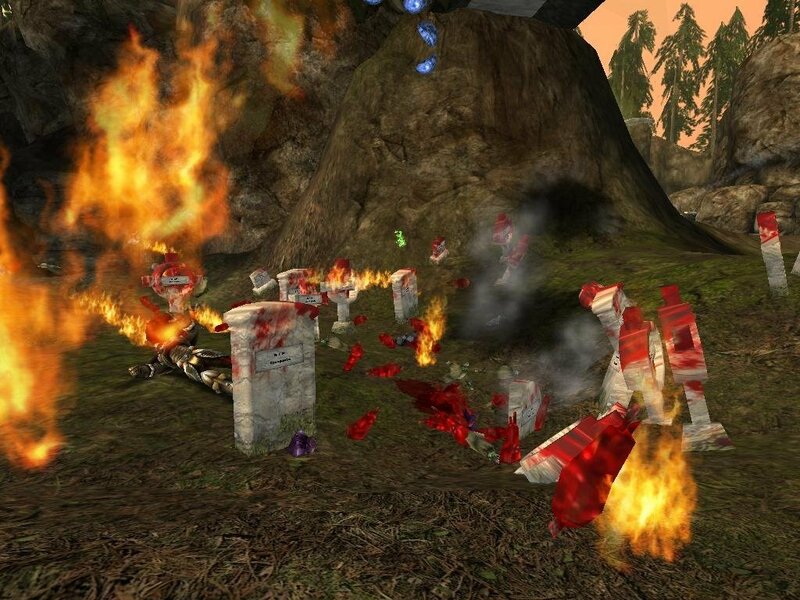 The tombstones are non-solid, and will last for about 90 seconds. Note: To see the chalk outlines or tombstones you must turn them on in the Client Settings of your Chaos configs! There is a one checkbox for the outlines, and one for the tombstones. Just for a little extra touch in certain maps, Chaos has included the lens flare effect for when you have the sun in view. Note: it only shows on maps which use the Sunlight Actor. 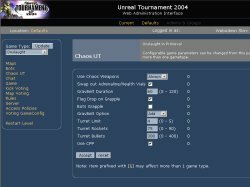 ChaosUT2 settings are available to server admins through UT2004’s Remote Web Admin feature. See the Server Setup page for more details.